It's finally spring break! Even though I have tons of homework to do, I'm pretty excited about not having to go to school. This is the outfit I wore today to go out for lunch and ice cream. It's funny how I used to hate ice cream, but now I'm gradually starting to tolerate it. ONLY vanilla ice cream, though. I actually ordered vanilla ice cream and a shot of expresso to mix them together. I can never not get coffee. This is a simple casual outfit, but, you know, sometimes I just feel like wearing shorts and a shirt. 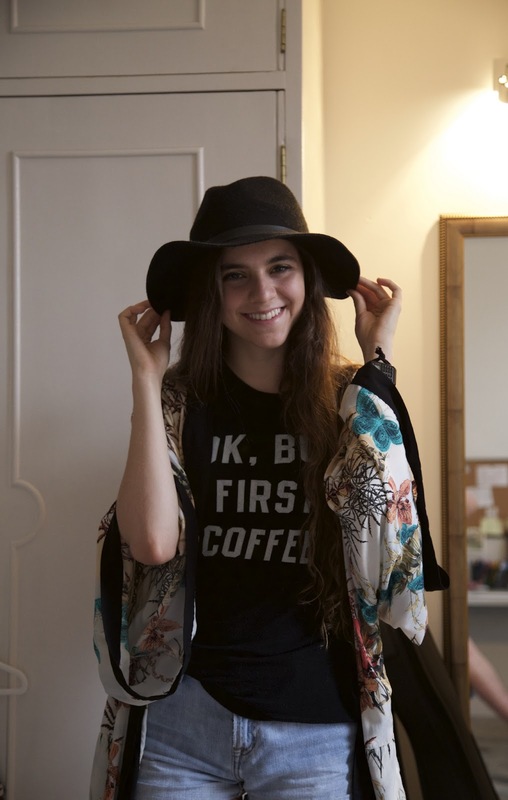 And, yes, I'm guilty of owning the "Ok, but first coffee" shirt from Brandy Melville. It's so accurate though. I also wore these New Balance shoes, which I am obsessed with. Thank you so much! The kimono is from Stradivarius, I totally forgot to mention that! I used to not like coffee and now I'm obsessed with it! They are so comfortable, I practically wear them with everything!